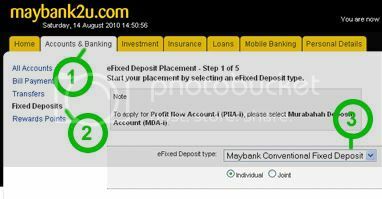 How to Use Maybank eFixed Deposit Online? Maybank eFD provides convenient way for FD account holder to make Fixed Deposit placements online. All transactions are real time. But, there’ll no certificate be issued. So, if you are willing to open Maybank eFD, then you just login to Maybank2u.com. Click on Accounts & Banking and you will see Fixed Deposits. Then, click on Make an eFixed Deposit placement. 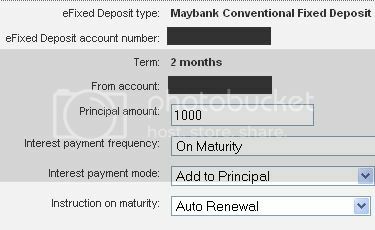 Next, you can select eFixed Deposit type (Maybank Conventional Fixed Deposit or Maybank GIA Mudharabah or Murabahah Deposit Account MDA-i). After that, please select term of your eFD. So there’s 1 – 60 months. For my case, you can see that I choose Interest payment frequency is On Matunity. Interest payment mode is Add to Principal and select Instruction of maturity to Auto Renewal. Just now I tested with RM100 with this Maybank eFixed Deposit but failed. So, there’s the minimum principal amount which is RM1,000 for 2 months and above, and RM5,000 for 1 month tenure. Why I Like eFixed Deposit? It’s pretty nice idea to be able to do FD placement through online without suffering from the long queue. This is because doing simple banking at branch could take up to few hours sometimes. It is advisable to print out the receipt for future references. This is to avoid any difficulties or issue with your eFD placement, and please remember that do not close your saving account. Make sure that it is valid and active as the eFD placement and withdrawal is link to your saving account. This entry was posted on Sunday, August 15th, 2010 at 9:00 am	and is filed under Bank & Investment, My Saving Plan. You can follow any responses to this entry through the RSS 2.0 feed. You can leave a response, or trackback from your own site. Well, i think is very convenient. For avoiding the long queue/traffic jam and at ease to find the cark parking, just to deposit the FD. One of the reason, i think it is better than placing in savings account. After all, 5k for 1 month, 1k for 2months, for short-period and time to time for easy monitoring. But query always float on my mind, can Maybank to be trusted. Afterall, there were too many complaint against ” them “. What does it mean, interest payment mode ADD TO PRINCIPAL or CREDIT TO ACCOUNT? Q:What does it mean, interest payment mode ADD TO PRINCIPAL or CREDIT TO ACCOUNT? A: It refers to your choice for mode of interest payment to you from MBB; either you want the interest to be add on to your principal or you want it to be credited to your other account (can be saving or current acc with MBB). The first mode (Add to principal) is always preferred as it can accure interest on the interest you gained before, upon the next mutuality period. whats the different between these fixed account? I guess Gia mudharabah is subject to the profit of investment in previoius month;- no fixed profit rate. Is there a specific amount you’re allowed to add? 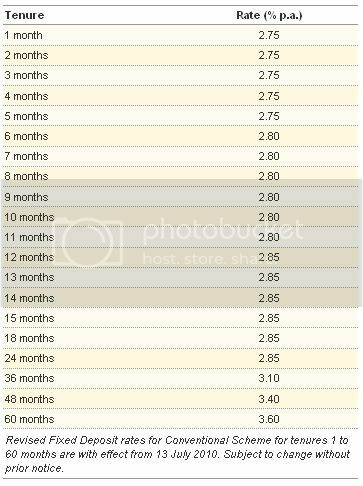 Should your next deposit match the first (initial) one? 2. Before maturing, am I allowed to withdraw/close off the eFixed deposit account without accruing any fines? @Angela: For conventional FD account, you need to have at least RM1,000 minimum deposit if you are doing over the counter. I tried to do RM100 through online FD see workable or not, but it fails. 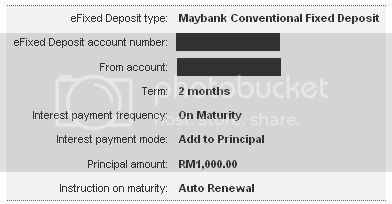 So, i can do analysis that min deposit for online FD also RM1,000. 1. No hidden fees incurred. 2. Yes. You can withdraw at anytime but you may lost some of your interest as penalty fees will be imposed on you. Can I apply one of the efixed deposits listed below via Maybank2u? Do I need to have specific bank account in order to apply for the Islamic fixed deposit? Hello, i did the GIA mudharabah by yesterday morning(Friday) with 5k and it was successful and shown in my M2U History but it actually not active in my Fixed Deposit column. I called to maybank hotline and i was told that they need 3 days to process but i think this is not possible right? Do anyone face the same problem before? Thank you very much. I suppose the MBB staff is right. I dont think eFD is STP (Straight thru processing); still need some approval on your FD before it takes effect or ‘valid’.